In the wake of Brexit, ascendant European nationalism, and the US elections, much has been written about populism’s threat to global trade growth and the international economic institutions established after the Second World War. There are a number of explanations for the turn inward. Many have blamed growing economic inequality within developed economies—some blame outsourcing or technological transition. Others posit that a decline in inequality may be a motivating factor. Danny Quah, Professor of Economics at Singapore’s Lee Kuan Yew School of Public Policy, and Kishore Mahbubani, the school’s Dean, blame populism’s rise on improved income equality across all nations. During the 1990s, a 70% income gap stood between emerging economies and the G7. That gap shrunk to under 14% in 2016 and will disappear by 2020. For those born in the 1940s, experiences in the U.S. labor force in the 1960s and 1970s framed their worldview. The United States was the world’s powerhouse economy after World War II, especially as the world’s number 2 and 3 economies Germany and Japan had been bombed flat, as had France, England, and Italy. In 1950 the U.S. produced 80% of all automobiles in the world, by 1960s US auto manufacturing was about half world production, and by 2000 the US produced 4 million more cars a year than in 1980, but that was one-fifth of world production. By 2015 twice as many cars were manufactured in China than in the U.S. and some 90 million were produced worldwide (according to Wikipedia page). If you look at 1950 in the Infogr.am chart at right from you can see how dominate the US (green line) economy was from the 1950s to 1980s. It should be no surprise that everyday Americans along with politicians and military leaders growing up and living through those decades believed the U.S. to be the world’s major economy and society. Though the US economy continued to expand, faster economic growth in China led many to believe something had gone wrong with the U.S> economy, and many blamed “unfair” trade deals. The chart seems to show the US economy declining after the 1950s, but that is an illusion. Instead, the US economy has expanded since the 1950s and 60s, with occasional recessions and slowdowns. 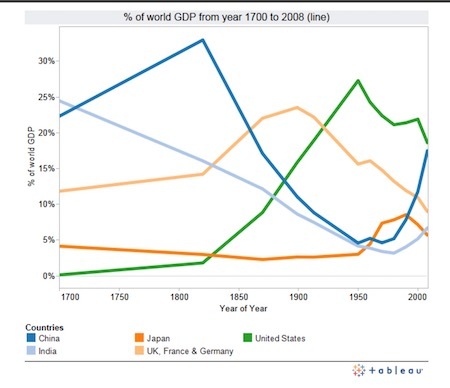 From the 1960s on, Germany, Italy, and Japan grew rapidly, then later Taiwan, Hong Kong, South Korea, and the UK expanded (and Italy slowed down). The economies of China since 1980s reforms and India since 1990s reforms took off as well. International investment and trade were major drivers of rapid economic expansion. In a presentation some years ago Michael Cox of Southern Methodist University asked teachers to imagine five people dropped in a jungle, and just one had a machete. The machete, a tool analogous to industrial revolution in the U.K. and U.S.–enables the lucky owner to cut a path through the jungle. But when the others pick up that trail, they can run faster and catch up. The complex technologies and factories developed in the UK, Western Europe, and the U.S. can and were duplicated for production in Mexico, South Korea, and China. 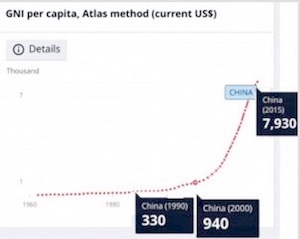 The blue line of China in the chart above soars from hundreds of millions of Chinese working long hours in “duplicate” Chinese factories, but also from new firms and factories developed by Asian entrepreneurs with new technologies and innovations (which then benefit consumers in China and around the world). Whether US or Asian, industries that succeed will be those that don’t pit humans against machines but use the latter’s speed and precision to let humans perform better. Asia has learned that lesson—it’s the global hub for advanced manufacturing and sophisticated logistics. What’s more, China is now the world’s largest consumer market for smartphones and other gadgets. And regardless of East or West, shrewd businesses will always look to capitalize on the opportunities available to them. Asia holds many. 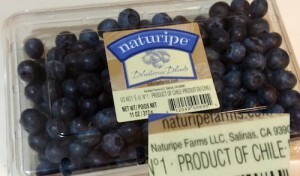 Juan José Gal’Lino, the executive director of Delaware-based Agro Vision Corp., said his workers at Olmos will ship the larger blueberries to China, where he says consumers pay a 30% premium for the bigger fruit. Smaller berries will continue to be exported to North America, where consumers don’t care so much about the size. Chile, the world’s top exporter of fresh grapes and blueberries, posted record exports of food, including fruit, livestock, wine and salmon, of just over $16 billion last year. That was about three times what it shipped abroad 10 years ago. According to Fred Landis (Investigative Reporter) on Quora: Chile has fallen from “one of the most egalitarian countries in Latin America to one of the most unequal.” He argues that President John F. Kennedy promoted egalitarian reforms which Chile’s socialist government expanded, but that President Nixon the villain, directing the CIA to help overthrow the Chilean government. 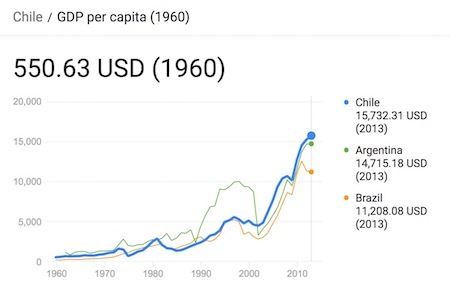 But economic policies matter apart from political turmoil, Though income inequality is likely far higher in Chile now than it was in 1960, average income is far higher too. For everyday people in Chile, average income per person in 1960 was just $550 per year. Yet by 2013 people in Chile enjoyed average income of $16,000 per year, according the the World Bank. Inequality can be far higher in a market economy, but even the very poor in Chile have higher incomes than people did on average in 1960. Average income per person in China rose from $70/year in 1960 to $330/year in 1990, to $940 in 2000, to $4,340 in 2010, and to $7,930 by 2015. Income inequality in China increased a some grew wealthy far faster than average. But income inequality between Chinese and U.S. workers decreased, as productivity in China’s textile mills and factories rose thanks to access to modern technologies. In Chile, Peru, and China before market reforms, incomes of everyday people were more equal but also far, far lower.